Your Credit Score – How Does It Actually Work? You may have heard of the term credit score before now, but maybe you’re not entirely sure what it means. Did you know that 45% of college students have no idea what their credit score is? It can be quite confusing. So if you aren’t sure what it is or how it is calculated, you might not fully understand the number that pops up. A credit score is simply a number that has been measured based on your credit file. It determines how well you are able to obtain assets and manage your finances. But, how do we come up with this number? Well, that’s a good question. Let’s talk about it. In this article, we are going to discuss how your credit score is weighed and some of the determining factors that can impact it. So, by the time you have finished reading this, you should know how your credit score is calculated as well as the factors that are taken into consideration. There are various factors that contribute to making up a credit score. The exact algorithm that is used to measure it is still kept private. However, we do know most of the criteria credit bureaus consider when determining your score. Each factor carries a certain amount of weight with it, with some being more important than others. But, what are these factors? We’re glad you asked. Below we’ve listed them below with an explanation of what each means to help you understand what makes up your credit score. First up on the list is your payment history. This is one of the most important areas credit bureaus look at when determining your credit score. Your payment history takes up a massive 35% of your score. If you have something like a mobile phone bill, car payments or anything like this, you want to be making your payments on time. If you don’t, this could severely reduce your credit score, and make it so that getting loans or contracts a lot harder. However, you do need to realize that a late payment of a few days is not going to count against you, and this will be the case until the payment is over 30 days late. It is still best to make your payments when they are due, but if for some reason you need a few extra days, this is not going to impact your credit score as long as you communicate with the account holder (e.g., the person or place you need to make the payment to). Making your payments on time is going to be the difference between an average (or fair) credit score and an impeccable credit score. Which will ultimately make the difference between getting what you want at a good rate or not getting what you want at all. The higher your score is, the more likely you are to be accepted for further credit in the future. This is one of the reasons it is so important to make sure that you can make your payments when you accept a line of credit. If you have any issues with making your payment, you should contact your credit provider and see if you can change your payments. This way, you will still be able to make your payments, and your credit score is not going to suffer. The next thing creditors take into consideration is the amount of debt you owe. This is another highly examined criteria that is carefully considered, taking up about 30% of your score. These percentages might not seem like big numbers, but they add up very quickly. If you think about it, the amount you owe and your payment history added together make a total of 65%, so you need to be careful. In order to maintain a good credit score, you want to keep your loan or credit utilization as low as possible. A helpful guideline many people follow is keeping your utilization ratio at about 30% of your credit limit. For example, if you have $3,000 of available credit, you only want to only borrow $900. Keep this in mind when you are working out what you need to borrow on credit and make sure that you can make the payments on what you have borrowed. It is always going to be better to owe a little across multiple credit lines, than a lot on one. The total amount of debt that you owe is going to be one of the most important factors to consider for your credit score, and it can have a massive impact on the number that is calculated. Lowering your amount of debt can be the key to getting a better credit score, and you want to be borrowing less to do this. Another thing that loan officers take into account is the length of your credit history. Though it weighs in significantly lower than the other two factors we have mentioned, this does not make it unimportant. Roughly 15% of your credit score is going to be made up based on the length of your credit history. This means that a history of responsible borrowing and paying back is going to work in your favor here. The longer history you have had with proving that you can be trusted to pay back what you owe is going to be a great way to get yourself a high credit score. People who have a credit score of 700 or over are generally considered to have a good credit score. However, those who manage to earn themselves a credit score of over 800 are viewed as having excellent credit. 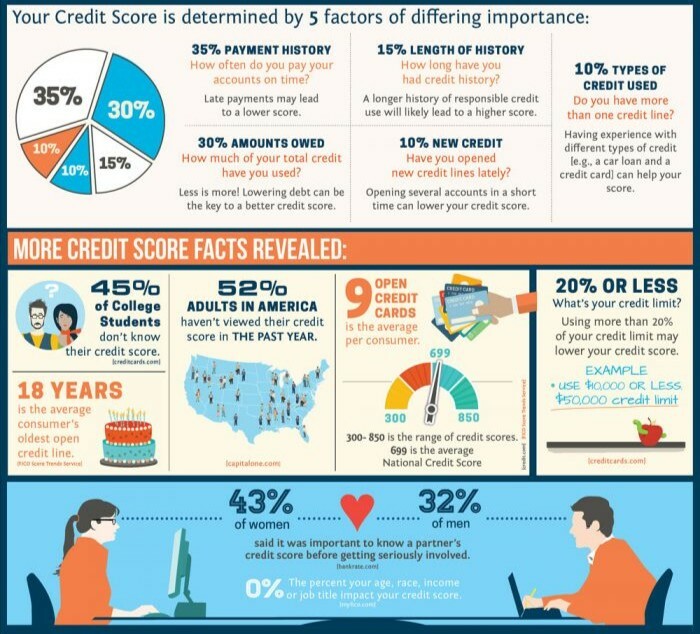 You will find that most of the people who have this high score typically have less than three credit cards, all of which have been open for over six years. If you are thinking of opening a new credit line, you need to think carefully about this choice. 10% of your credit score is calculated based on your new credit lines, and if you are opening multiple in a short period, this is going to lower your credit score. In some cases, when you apply for a mortgage, all of the inquiries that you make within 30 days are going to be grouped as one inquiry, meaning that this will not have a significant impact on your credit score. When you are looking for a new line of credit, you want to make your inquiries rather close together. Some mortgage companies will allow your inquiries to be grouped together as one inquiry and you will not have your score impacted by much. This is going to be useful for people who need new credit, but like to look around for what is the best offer to them. The last factor that loan officers will consider when looking at your credit score is the type of credit that you have. This will make up 10% of your final score. You might have more than one credit line at the moment, and this is fine, meaning you have nothing to worry about. For example, you might have a car that you are making payments on, a credit card, a mortgage, etc. Having this experience with multiple credit lines might actually be able to help your credit score, as it proves that you are reliable and lenders can trust you to pay back what you borrow. So keep in mind that there are different types of credit that you can acquire. An installment loan such as for a car is different from a loan that utilizes a revolving credit system, and so on. As many as 52% of Americans haven’t viewed their score in the past year. Having a good credit score is the key to having everything you want. If you’re trying to repair or rebuild your credit, the first thing you need to do is take a look at it. See where it’s at and then break down your score into sections you can work on one at a time. You may also want to consider seeking advice from a mortgage company such as A and N Mortgage. When it comes to opening a line of credit as they are one of the top companies in this field. They will be able to help you better understand your credit score, and what it can mean for your loan options.